This is our knowledge base, where you could find answers of frequently asked questions. Feel free to browse the topics and if you can’t find the answer you need, feel free to contact us by mail or search the site content for more relevant info. Is the TITEX competition bar IPF Approved? Yes, the TITEX Competition bar has a limited lifetime warranty. o Rack work – rack training carries an inherently high drop risk onto safety pins. (Utility bars are recommended for this type training). Is knurling covered under warranty? The limited lifetime warranty assures the customer that when used properly a TITEX bar will not permanently bend. Specifically, this means that it isn’t covered when dropped or dumped in a cage or on a spotter rack. Any brand of bar can bend when subjected to the concentrated forces associated with dropping a bar on the very narrow area of a spotter rack or safety bar. 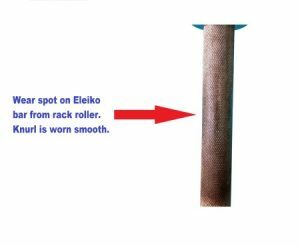 As for knurl wear, if you have a combination rack with metal rollers, expect flattening of the knurl. The concentration of weight on this narrow of an area will cause flattening. However, thisdoes not affect the integrity of the bar either in terms of straightness, strength, finish or critical knurling requirements. (The part that is flattened is not a critical area necessary for any of the competitive lifts. In fact, this area makes no contact with the body during the execution of any of the three lifts). A quick note regarding the bar finish. The finish is actually the result of a black oxide treatment that converts the surface of the steel into magnetite. That means that the finish is not plated or applied like a paint that can be flaked, rubbed or scratched off. In answer to claims that this doesn’t or won’t happen on another brand of bar, please see the attached photo of an Eleiko bar. This is normal wear and tear that will occur on any brand of bar. Multi-racks on the market currently employ either metal or plastic rollers. There are distinct advantages and disadvantages associated with the use of each. The philosophy of each individual manufacturer determines which material is used on their particular model. Why is my TITEX bar rusting/oxidizing? The TITEX bar will not rust in any climate, unless the integrity is compromised. As long as the black magnetite surface is not scratched, chipped or any type of bare metal is exposed. There is no warranty on surface imperfections because of the daily turbulence the bar is exposed to. Any of the turbulence listed, may compromise the integrity of the bar surface. Perspiration, chemical contaminants on the lifters hands and environmental contaminants. It is important that you clean any chalk out of the knurling after use. Chalk buildup in the knurling will attract moisture buildup and in turn cause surface rust to develop. To properly remove the chalk without damaging the bar surface, you must use a soft non-abrasive nylon bristle brush. Do not use a wire brush or any hard brush as you will rill risk scratching the oxidized surface of the bar. To protect the bar surface and remove any buildup of surface rust, it is important to spray the bar with WD-40. It will act as a lubricant and protectant while removing any existing surface rust, keeping your bar in optimal condition. Are TITEX plates covered under warranty? No, due to the nature of Olympic plates and their use, they are not covered under warranty for cosmetic imperfections and damage. Are TITEX Plates IPF Approved? Yes, TITEX Plates are IPF Approved for all competition use.